By now, I feel like I am an expert in all things outdoors in Tennessee. I’ve been a Tennessee resident for over a year (just don’t check my ID! I may or may not still have a Florida drivers license…). With countless weekends spent exploring the volunteer state, Tim and I have logged a couple of miles on some awesome hikes in Tennessee. We get asked all the time where we recommend people visit, so as we’ve explored each part of the state with friends and families, we’ve come up with some of our favorite hikes. 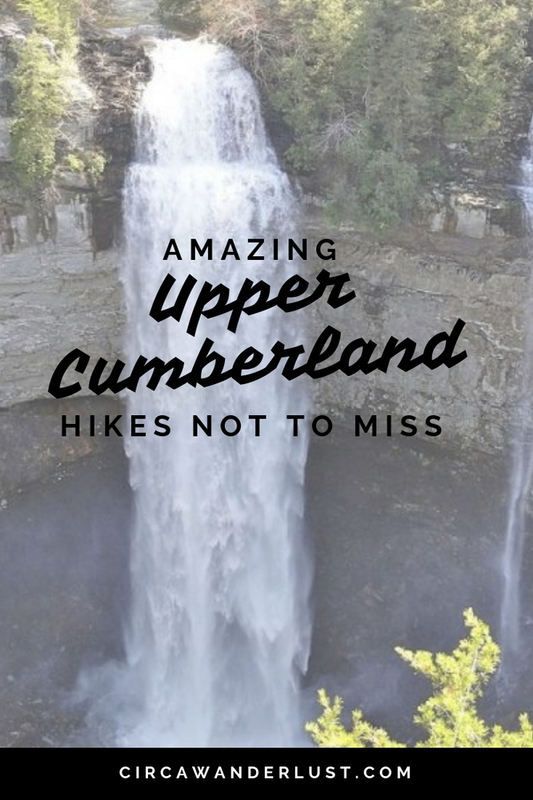 If you love to hike and explore, the Upper Cumberland Plateau is the perfect place to be. While there are many small trails to enjoy, here are a few awesome trails that I think you will enjoy and I want to share with you. These all make for great day trips! One of my favorite things about these trails is the fact that quite a few are dog-friendly since they are found within the Tennessee State Parks system. Just make sure you keep them on a leash and bring poop pick up baggies. City Lake Falls is a great 1.2 mile round trip trail near Cookeville, Tennessee. The trail is great for all hiking levels and is a great option for a quick walk on a nature trail. This kid-friendly hike has a short wide path that is stroller friendly. As the creek runs alongside the path, you will get a chance to hear the water flow. This quick and easy hike has the payoff of a waterfall, so grab the kiddos and some snacks for a quick day of exploring. Black Mountain Crest Loop Trail, located near Crab Orchard, is a one-mile trail in a gorgeous forest setting that is accessible year-round. It shares a portion of the Cumberland Trail and passes through some pretty awesome rock formations. Along the trail, you will find several scenic overlooks with some stellar views! If you’ve been hoping to catch a mountain view of a sunrise or sunset, the Black Mountain Crest Loop Trail is a great place to catch one. On clear days you can even see the Great Smoky Mountains from the trail! And don’t forget Fiddo! Dogs are also welcome on the trail just keep them on a leash. Rock Island’s Twin Falls Trail is a 1.1-mile hike you don’t want to skip. At its best between March and October, this is another great trail to bring your dog on. Twin Falls is located in Rock Island State Park, near Great Falls Dam at the end of Powerhouse Road in Walling where you can step out and take in some breathtaking views of the falls and its dazzling cascades. Twin Falls is a strong and powerful waterfall, but we can’t give all the credit to mother nature on this one. The falls are actually caused by the local dam that backed up the Caney Fork and Collins Rivers. Though man-made engineering diverted water from the Collins River to the powerhouse, mother nature can’t always be tamed. Water from both rivers forged its own path and gave us Twin Falls. The area has lots of trails and areas to explore so be sure to pack a lunch or dinner and stay awhile. You never know what hidden nature gem you might find… If you are looking to chase some waterfalls there are plenty nearby! The mostly dry Great Falls is just upstream. Burgess Falls, Fancher Falls, Evins Mill Falls, and Cul-Car-Mac Falls are all to the north around Center Hill Lake. 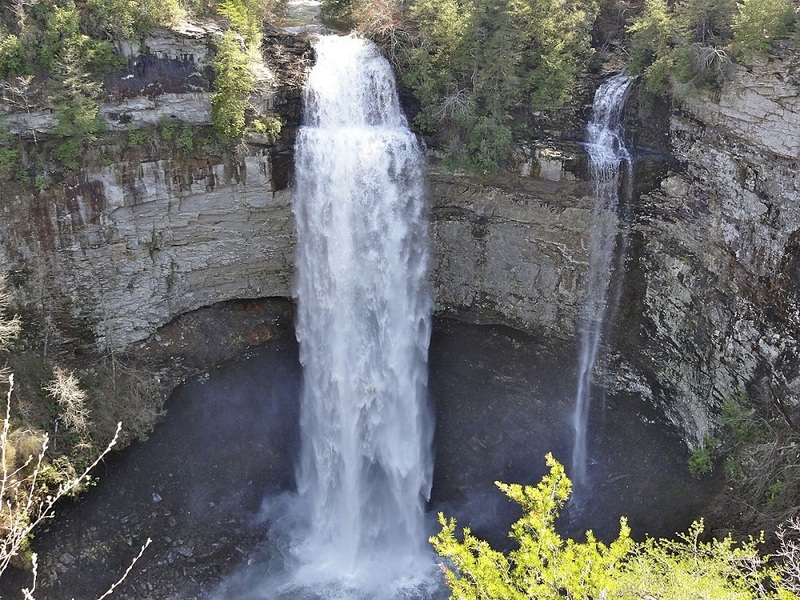 Cane Creek Falls and Fall Creek Falls are 40 minutes away to the south. Fall Creek Falls State Park is Tennessee’s largest and most visited state park which isn’t surprising when you learn that the park is home to more than one waterfall. With cascades, gorges, waterfalls, streams, and hardwoods that cover more than 26,000 acres, this state park is truly one of the most amazing in the country. And it is one of my favorite places to explore for awesome hikes in Tennessee! If you love chasing waterfalls, Fall Creek Falls (the waterfall, not the park) is one you don’t want to miss. At 256 feet, Fall Creek Falls is one of the highest waterfalls in the eastern US. 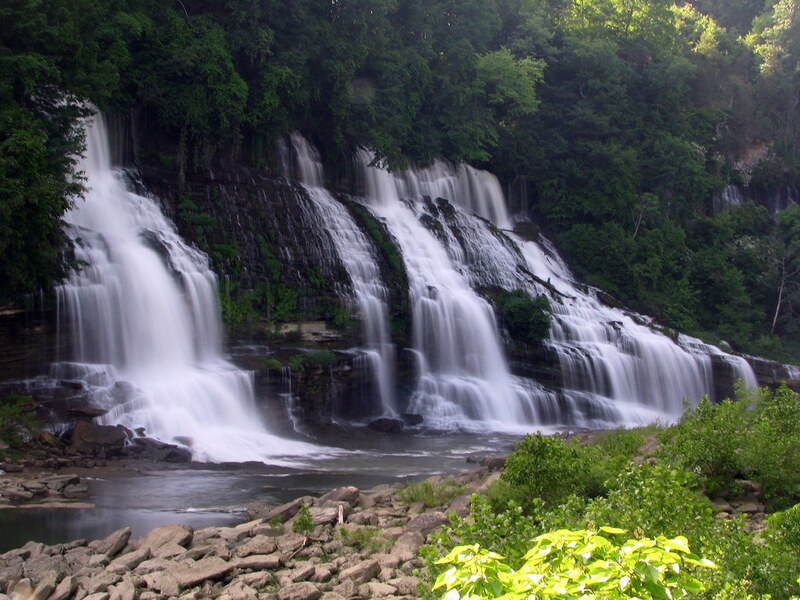 The park has 3 other waterfalls that you can also visit: Piney Falls, Cane Creek Falls, and Cane Creek Cascades. With over 56 miles of trails that can be explored and 2 overnight trail options (for those adventure-seekers out there), you’ll find plenty of opportunities to explore, see nature, and allow yourself to breath fresh air. We saved the best for last when it comes to awesome hikes in Tennessee! If you are looking for the crown jewel of hiking, this might be it! Oh, what is that you say? Another waterfall hike? No, no, this hike is much better! In the Virgin Falls Pocket Wilderness Area, a 1,157-acre natural area in White County is the 8-mile round trip hike that will most likely take you most of the day but is totally worth it. Along the trail, you will find not one, not two, not three, but FOUR breathtaking waterfalls- Big Branch, Big Laurel, Sheep Cave Falls, and Virgin Falls. Make sure you pack plenty of snacks and don’t forget your camera! It is at the wilderness area’s namesake waterfall, Virgin Falls, that mother nature shows off while playing a trick on your at the same time. The falls, which were formed by an underground stream that surfaces from a cave that then drops over a 110-foot cliff only to disappear into another cave at the bottom of the sink. There is so much to do in this part of Tennessee that you could easily spend your whole summer vacation exploring all it has to offer visitors. 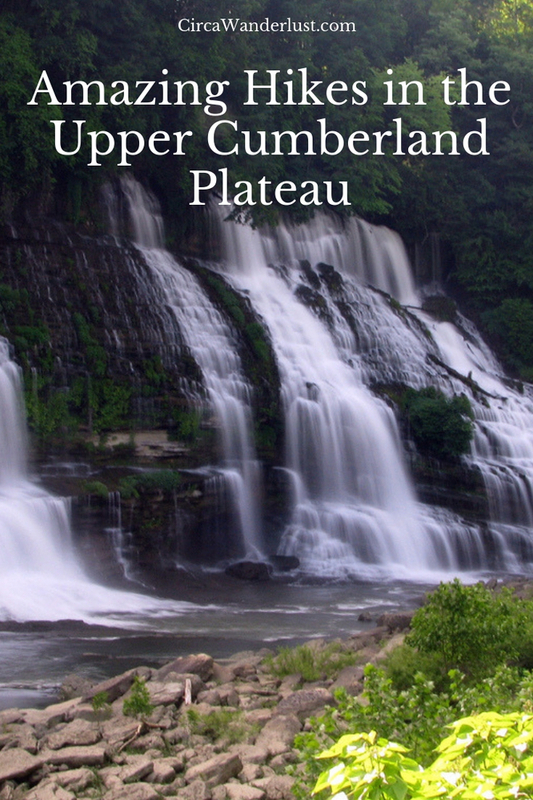 Guys, I’m not even joking when I say that Tennessee’s Cumberland Plateau is an outdoor enthusiast’s dream come true! There are a number of geological wonders ready to take your breath away. 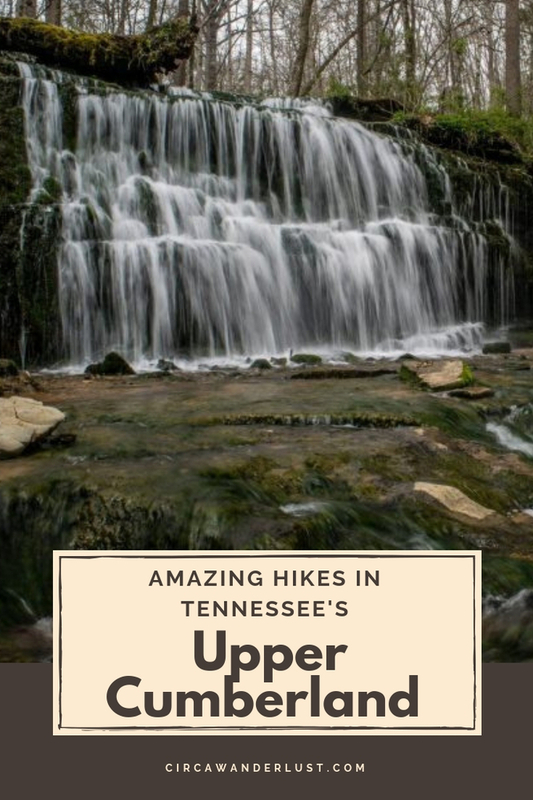 As you explore these awesome hikes in Tennessee, you’ll see natural bridges, stone arches, chimney formations, caves, and waterfalls.